This post is part one of a three part series using the UDL lens to make learning personal for all learners. Part Two: The Personal Learning Backpack (PLB) identifies tools, apps, resources, skills, and strategies to support learning. Part Three: The Personal Learning Plan (PLP) guides learners to achieve the goals and skills they need to be self-directed and independent. Universal Design for Learning® (UDL) is a researched-based set of principles developed by CAST (Center for Applied Special Technology) in the 1990's to help guide the design of instruction and learning environments. The idea behind UDL is to reduce barriers to learning and optimize the level of support and challenges to meet the needs and interests of all learners in the classroom. Educators asked us to provide a clearer and more practical way to apply these three principles in daily teaching and learning practices. In early 2012, we decided on these three terms: Access, Engage and Express™ to provide the lens for understanding how every learner learns best. All learners are unique and have variability in how they access and process information, engage with content, and express what they know and understand. Access, Engage, and Express is the UDL lens to understand how learners learn best and help teachers in designing instruction. Each learner comes to school with strengths and challenges along with a set of interests, talents and aspirations. We often discover some of these qualities through the course of the year by having conversations, by how each learner responds in class or through a set of data that has been collected from standardized testing. But what if you could discover the learner in every child at the beginning of the school year using the UDL lens of Access, Engage and Express? Every learner can benefit from creating a Learner Profile. It tells us about a learner that learning styles or an Individual Education Plan (IEP) does not tell us. 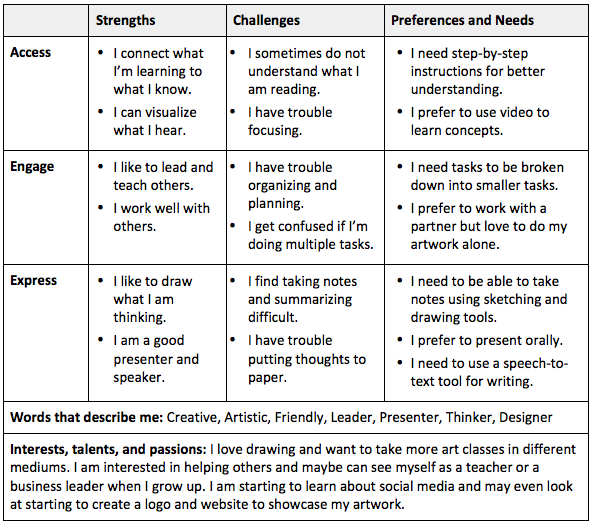 Here is an example of a learner that may have similar challenges as some of your learners, but we want you to look closely at this learner's strengths along with her interests, talents, passions and aspirations. Now think about the learners in your class and in your life. What are their strengths and challenges in how they Access, Engage and Express? How do they need or prefer or need to access information, engage with content and express what they know and understand? What are their talents, interests, passions, and aspirations? Who are you as a learner? Using the UDL lens of Access, Engage and Express to understand learners can not only help a teacher to better design instruction and learner materials, but it can also offer learners a way to tell their story and how they learn best. This learner has reading, writing and organizational challenges. Children with this profile often do not see themselves as learners. In this case, when this learner uses the Learner Profile, she can now tell her story and have a conversation with her teacher about who she is and what she may prefer or need to support her challenges and enhance her strengths. She can also share what her interest and talents are, what she is passionate about and what she aspires to be. It is really clear from her LP, that art and drawing means a lot to her. Let's take a closer look at her strengths where she visualizes what she hears, likes to teach her peers and present in class. Now we understand this learner's strengths and challenges, preferences and needs including what engages her about being an artist. With this first conversation, the relationship between teacher and learner begins. When learners use the UDL lens of Access, Engage and Express to share how they learns, it helps them tell their story of who they are as learners. Above all, it validates them as learners and listening to them says how much you care. Telling their story helps them advocate for themselves and ultimately it builds a strong partnership in learning between the teacher and learners. 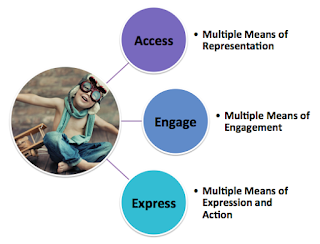 This is Part One of a three part series on using the UDL lens of Access, Engage and Express to develop a learner with agency. In Part 1, we introduce you to the Learner Profile (LP) and how it can be used by both teacher and learner to discover the learner. In Part Two, we will take the Learner Profile and develop a Personal Learning Backpack (PLB) that includes tools, apps, resources and the skills the learner needs to become an independent, self-directed learner. All of this along with templates are in our new publication, How to Personalize Learning: A Practical Guide for Getting Started and Going Deeper, premiering on October 18th. Universal Design for Learning is a registered trademark of CAST, Inc -Access, Engage and Express is a trademark of Personalize Learning, LLC. How can Kids Own the Learning?